Become the father of the year in Nier. Monkey Magic! Come on, Monkey! Gamers of a certain age remember the tradition of the Saturday morning cartoon. You’d get up early while your parents stayed asleep, pour your favorite cereal, and plant yourself in front of the television as cartoon after cartoon aired from dawn until the afternoon. 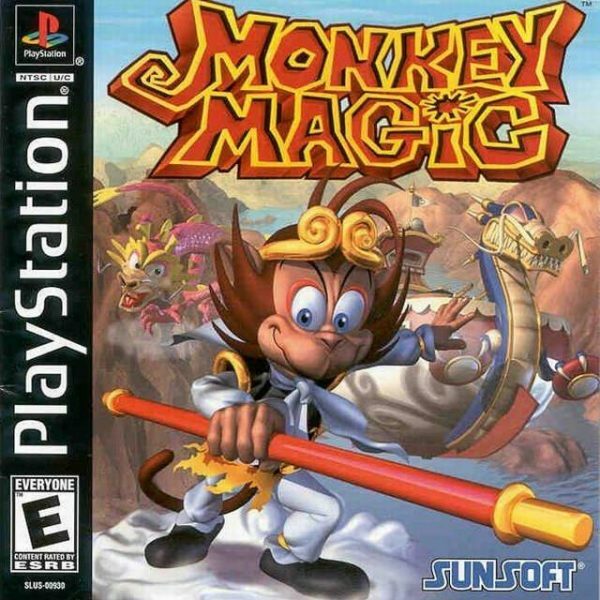 In Monkey Magic for the PlayStation, chances are you’ll feel like you’re a little kid again as you watch and play through Kongo’s quest to save the universe from the Dearth Voyd. While slightly unpolished, this 2D platforming adventure has all of the ingredients for a Saturday morning cartoon: a wise-cracking hero, silly villains, top-notch voice acting, and a classic story. A true diamond in the rough, Monkey Magic comes recommended to those that wish to step back to a simpler time. Inspired by the popular Chinese novel Journey to the West, Monkey Magic adds both youthfulness and silliness to the classic story. 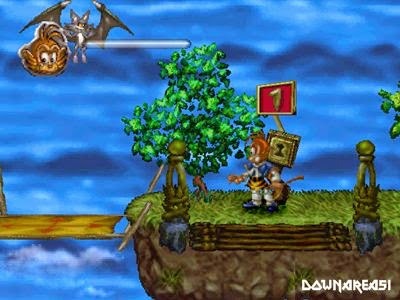 You take control of the Stone Monkey, Kongo, on his quest to gain the Divine Power. Guided by a devious little bat named Batty, Kongo has to worry about a celestial army, the diabolical Dearth Voyd, and an army of monsters. But, he’s more than up to the task. This little monkey is more capable than he looks. There isn’t much more to the plot. If you enjoy silliness from cartoons of yesteryear with a touch of Chinese mythos, then you’ll enjoy this. Monkey Magic really delivers with its presentation. Characters are not only fully voiced, but they’re fully voiced well. I’m not sure if the same actors and actresses were moved from the show to the game, but I do know that the talent is there. Monkey Magic’s Saturday morning style is reflected perfectly in the game, whether it’s the animated cut scenes or the vivid 2D sprites. Sadly, aside from the opening theme, the music took a major backseat. Admittedly, my expectations for playing Monkey Magic were low. Games based off of television shows usually leave much to be desired. But, there was a surprising amount of effort in creating a decent action platformer. Monkey Magic consists of four stages, with each stage divided into smaller sections or levels. As you move Kongo through each one, you’ll find various items to gather such as fruits, emblems and extra lives. At the end of the stage, you’ll be judged with how many of each you gathered. If you gather enough, you’ll be allowed to save your progress. I know that sounds bad, but given how short the game is and how you’re allowed to save to at the end of a stage, most gamers won’t have anything to worry about. Gathering isn’t the only thing you’ll do. Enemies will sometimes try to block Kongo’s progress. Sadly, “combat” isn’t anything other than a button mashing test of patience. 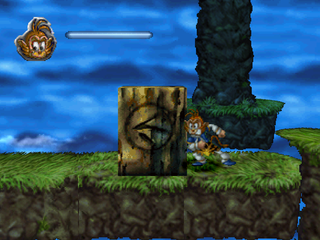 In the second stage of the game, Kongo will learn four magical abilities. An interesting feature is that magic can be used on himself and on his enemies. You’ll need to do both to solve some of the game’s puzzles. Surprisingly, some of the puzzles in Monkey Magic require more thought than expected. It’s odd given the game’s juvenile nature. Odd, but fun. Since Monkey Magic is relatively simple, having a puzzle to change things up provides a nice change. Puzzles can range from simple to clever, but they’re always fun. As Kongo continues his journey he becomes more powerful. By the time you reach the fourth stage, Kongo will have infinite magic power and infinite lives. The journey to get to this point has a few challenges, but a generous supply of extra lives and restorative health items makes the journey painless. In fact, the most difficult challenge in Monkey Magic is the lack of tight controls. They work, but they’re not reliable. A jump here or a duck there won’t react as quickly as you’d like. Due to the way you swap magics, you may end up setting yourself on fire instead of the enemy. It can get frustrating, but again, I never worried about running out of lives. I’d go as far to say that Monkey Magic is almost impossible to lose. If you’re looking for a challenge, then you’ll want to look elsewhere. I finished Monkey Magic over the course of a few days, but it can be easily finished in a few hours. I just wanted to take my time with it since the instruction manual flat out tells you that the game only consists of four main areas. With Monkey Magic, I was able to find another game that’s fun to play when I need a break from the long, lengthy RPGs I’m used to. It won’t be at the top of my replay list, but I’m happy to know that the show was popular enough to bring us this fine little 2D platformer. Most importantly, it brought me back to a simpler time before I even knew what video games were and relied on Saturday morning cartoons for my entertainment purposes. Overall, 6.5/10 – Journey to the west in a clumsy, cartoony and cute action platformer based off a lesser known series.